Curo Technologies, a Melbourne, Australia-based healthtech startup, announced this week that it is opening its first U.S. office in Ann Arbor, MI. Steve Hopkins, who will run the Ann Arbor office, said Curo’s decision to expand to Southeast Michigan makes good business sense, as it allows the company to tap into the area’s technical talent while maintaining relatively low operating costs. Hopkins, who is based in nearby Dexter, MI, and comes from an eldercare background, said he wanted to build Curo’s U.S. presence from essentially his own backyard. Hopkins described Curo as a software company that takes “well-being data” from the homes of elderly adults and turns it into usable information for “stakeholders” such as families, caregivers, and insurance companies. Unobtrusive sensors are placed in clients’ homes, capturing information such as how and when people move around, when they take their medication, what time they eat their meals, and when they sleep. That data is then relayed to interested parties through Curo’s smartphone app, which sends alerts when a client falls out of his or her normal routine. Hopkins said the goal is to better understand day-to-day care and what the elderly need to be independent while remaining at home. 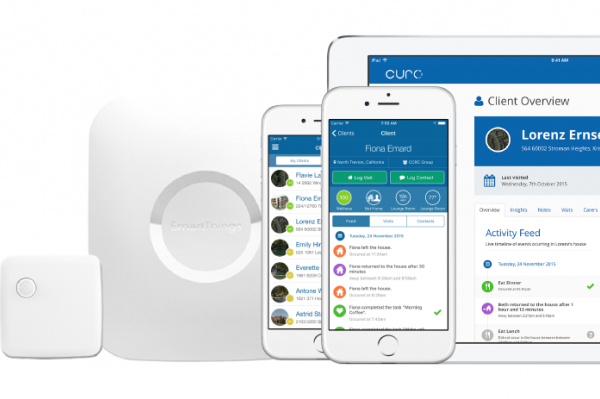 Curo integrates its software with Samsung sensors and hubs to deliver client data. The sensors primarily track motion and the movement of objects such as a pill box or toilet seat. Although the Samsung hubs can accommodate up to 24 sensors, Curo’s research has shown that most people only need six. Hopkins said the system is so unobtrusive, most people forget about it after the second day. Curo’s four-person Michigan team is currently working out of Ann Arbor SPARK’s downtown office. The decision to open in the U.S. was finalized after the company scored a $1 million investment earlier this year from Australian insurance company HCF. Over the next year, Hopkins said the company plans to add a handful of mostly technical support staff in Ann Arbor. A year from now, Curo also plans to start marketing its services directly to patients and their families. Right now, the company’s customers are mostly large providers of care and insurance, Hopkins said.